GoPro vs. Dash Cam: Can a GoPro Really Do Double Duty? Can a GoPro really do double duty? There are a number of semi-viable dash camera alternatives out there, and a GoPro is one of the better options. However, there are a number of reasons to avoid using a GoPro as a dash cam, not the least of which is the fact that it’s a pretty expensive piece of hardware to just leave sitting in your car. Unlike most digital cameras, your GoPro comes with the single most important dashcam feature built right in. That essential feature is looped recording, which allows a camera to automatically replace old video files once there is no longer any storage space left. So the main things you’ll want to do if you’re going to use a GoPro as a dash cam are to turn on the looped recording feature and get yourself a skeleton housing. Unlike the waterproof housing, a skeleton housing will allow you to power up the camera while it is in use. You’ll also need a 12 volt USB adapter or a 12-volt charger with a micro USB connector to plug the GoPro into your cigarette lighter or accessory socket. Absent a skeleton housing, you can drill an access hole in your GoPro case. But skeleton housings are relatively inexpensive, so there’s really no reason to destroy your waterproof housing. Once you’ve activated looped recording and put your GoPro in a skeleton housing, you can mount it to your dash or windshield, and you’re good to go. The main drawback, of course, is that you’ll have to turn it on to record every single time you drive. The main reason not to use a GoPro as a dash cam is that it’s a pretty expensive piece of hardware to repurpose as a dash cam. If you’re planning to still use it for other purposes, that’s fine. But keep in mind that you’ll have to make sure you have it with you every single time you drive, and you’ll have to mount it, plug it in, and turn it on every single time you drive. If you forget just one time, and that’s the time you get in an accident, you’re out of luck. This isn’t an issue if you have an extra GoPro laying around, and you plan on just leaving it in your car. However, there are still a handful of good reasons to think twice before you do so. For instance, and this is particularly true if it’s a GoPro Hero 4 or Hero 5, do you really want to leave such an expensive piece of equipment in your car, right out in the open, where anyone can see it? Studies have shown that vehicle burglary is usually a crime of opportunity, so leaving expensive electronics out where a would-be thief can see them can actually increase the likelihood of your car getting broken into. According to the National Crime Prevention Council, even spare change visible from outside a vehicle can be enough to entice a thief to smash and grab, so your expensive GoPro could easily become a target. There’s also the issue that GoPros are action cameras, not sit-in-a-hot-car-all-day cameras. It can get tremendously hot inside a parked car even on a cool day, so you’ll want to give a thought to the longevity of your device before you opt to leave it in your vehicle full time. While a GoPro can stand in for an extremely basic dash cam without missing a beat, mid-range dashboard cameras have some useful features that you just can’t duplicate with a GoPro. For instance, if you wire a dedicated dash camera into your vehicle’s electrical system, it will turn on and automatically start recording every time you start your car, making it impossible to forget to turn it on. Some dashboard cameras also come with GPS and shock sensor functionality. With built-in GPS, a dash cam can record exactly where you were, and how you were moving, before and during an accident. 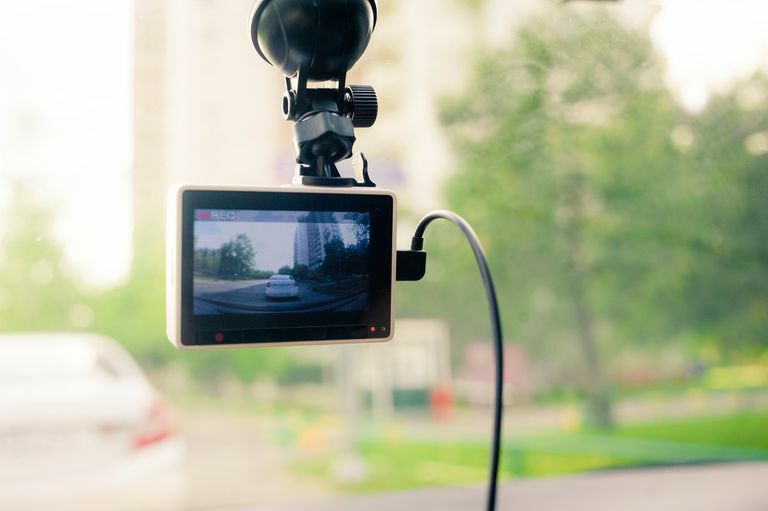 Shock sensors allow dash cams to activate — or mark a recording as an accident so it doesn’t get overwritten — any time your vehicle experiences a sudden change in acceleration. Even some dash cam apps have those and other features that can make your phone more useful than a GoPro in this application. And your phone has one huge advantage over a GoPro in that you probably carry it around everywhere already, so you won’t have to specifically remember to bring it each time you drive. Dash cam apps still suffer from some of the same problems as GoPros in this application, but if you don’t want to buy a hardware dashboard camera, then you might want to look at an app before you go to the GoPro. Where Are Dash Cams Legal and Illegal?